The liberal media is outraged over the 4-5 anti-Obama hecklers at the GOP rallies this week. They followed that up with headlines about the opposition candidate being booed by conservatives. This prompted a leading Democrat to declare that the McCain-Palin people are just like the famous racist Democrat George Wallace. 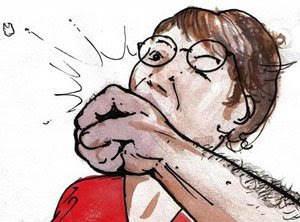 This piece artwork designates Sarah Palin as a “M.I.L.P.” (Mother I’d Like to Punch). Michelle Malkin has put together a collection of this despicable Leftist filth. I suggest the GOP:Lib rage factor is most likely like what you would find on the internet where nutroot’s profanity exceeds right wing profanity 18 to 1. Here’s a clue for the media. When the conservatives start mass producing “Obama is terrorist” signs, working “F*** Obama” into their comedy routines, pushing “abort Obama” stickers, then get concerned.